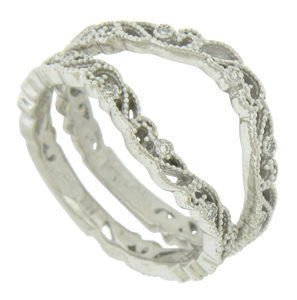 Delicate curling vines adorned with milgrain decoration covers the surface of these elegant antique style wedding bands. 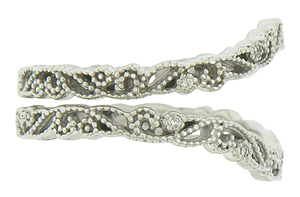 Dazzling, round cut diamonds are set into these sparkling vines. 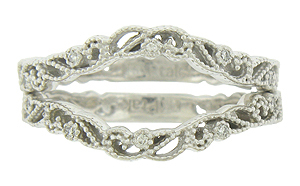 Fashioned of 14K white gold, the curved bands are shown with R901 (sold separately). 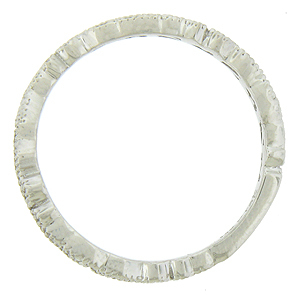 The rings measure 2.50 mm in width. Size 6 3/4. Most often sold as a pair for $650, they are also available individually for $325. 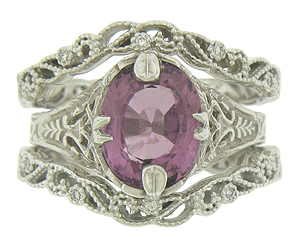 They are also available in other sizes as well as 18K, yellow and rose gold. Contact us for current market cost.